The trailer markets “The Favourite” as British court farce, with clips of lavishly dressed scene-eaters. Ever-challenging director Yorgos Lanthimos, however, turns the genre on its head, no doubt disappointing those who thought they would see a period “Fawlty Towers.” The straightforward plot pits a trusted but manipulative counselor to a monarch against a younger and even more manipulative upstart. 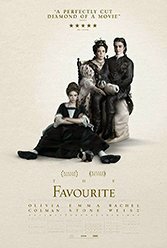 Unlike in typical British farce, Lanthimos plumbs the emotional and psychological depths of his three main characters, offering indelible portraits: the female monarch makes her bedroom a warren for a herd of rabbits who stand in for the 13 babies she lost; the political conniver aims to keep Britain at war with France, playing politics à la Margaret Thatcher; and the schemer, who is pushed from a carriage into the mud, marking her fall from royalty and grace, returns with a vengeance. Lanthimos sometimes has an obscenely grotesque, over-the-top sensibility (“Killing of a Sacred Deer,” 2017). Here he harnesses his peculiar talents to produce a more accessible —yet at the same time unique —result.